Rumors Indicate Unveiling of iTime Next Month - Smartwatch This! The buzz about Apple’s possible launch of the iWatch has fueled much speculation over the past couple of years, but mum’s the word from the Apple Camp. This week, however, the tech world is going crazy after an apparent slip-up hints at a possible unveiling of the iWatch from Apple next month. John Gruber of Daring Fireball, a well-connected Apple blogger who has been spot on before with his Apple knowledge and predictions, hinted at an announcement to be made by Apple in September for the iWatch, or what he calls Apple’s “wrist wearable thing”. Many are denouncing the rumor on the basis that they doubt that Apple would release the iPhone 6 and the iWatch in the same month, and other Apple fans and bloggers agree with Re/Code’s statement that Apple plans to schedule an event in October to unveil the watch. It could be that Apple will simply announce the plans for the iWatch during their September 9th launch event for the iPhone 6, and that the actual unveiling will occur in October as previously rumored. 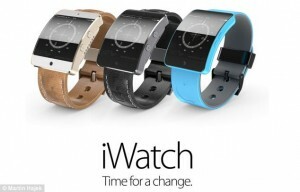 Either way, we think it’s safe to say that the iWatch is right around the corner.